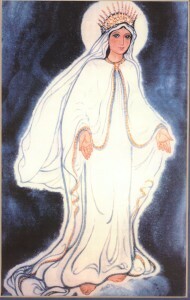 This likeness of Our Lady of Light that appears on this website and on the Our Lady of Light prayer card was painted by a Cincinnati artist. In 1992, she was presented a wonderful opportunity to portray the local appearance of Mary, the Mother of Jesus. This is her story. In 1990, the artist and some members of her family had made a pilgrimage to Medjugorje. While there, like so many others, she had experienced a strong conversion. On returning to the States, she had felt in her heart the desire to create something artistic in praise of the Mother of God, to use her talent in the service of Mary. One Friday night in 1992, she attended a prayer session, held at St. Joseph Church in Cold Spring, Kentucky, which was led by Fr. Leroy Smith. There she learned of a Batavia, Ohio visionary and how this person was privileged to have seen Mary. The artist imagined in her mind how this Lady of Light, as she was being called, might look. Again she experienced a strong desire to reproduce Mary’s image in a painting. After hearing this wonderful description of Mary, the artist was inspired to begin again with renewed spirit and vigor to try to capture Mary’s beautiful image in a painting. The style, media, and method of painting is uniquely the artist’s. She wanted to emphasize the spiritual aspect of Our Lady of Light’s appearance and the importance of her message, a message of prayer, fasting, conversion and reconciliation with one another, as well as a personal consecration to the Immaculate Heart of Mary and the Sacred Heart of Jesus. She would accomplish this by painting a symbolic or icon-like image. The painting was completed by August 31, 1992, and was presented to Fr. Leroy Smith the following day, September 1, 1992, at St. Joseph Church. Fr. Smith brought the painting with him to Our Lady of the Holy Spirit Center when he came there to live in the spring of 1993. The painting now hangs in the headquarters of Our lady of Light Ministries at Our Lady of the Holy Spirit Center in Norwood (Cincinnati), Ohio. It has been reproduced for the prayer card, and for all subsequent renderings of Our Lady of Light, including the home page of this web site.